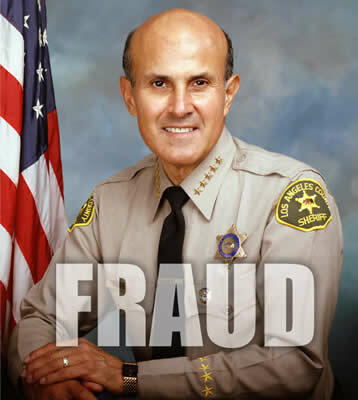 Sheriff Lee Baca is using the typical coward approach of judges, government and police. He could see he was going to be found guilty so he resigned to keep millions of (embezzled?) tax paid dollars which come in the form of salary, benefit etc. All which he did not deserve. After all if you’re committing crimes while a peace officer, using your position, badge and uniform to get away with crime and dishonesty he has no business keeping that money. Abuse of power much be addressed in America and have the harshest punishment, death penalty would not be out of the question as it would instill fear in those who obviously have no fear when hiding behind a badge. This fraud and con-artist must lose everything, the home, savings and all his benefits. INVESTIGATION: DID SHERIFF LEE BACA’S FURY PUSH DEPUTIES TO BREAK THE LAW? Why did it take the DOJ so long to act? Did Sheriff Lee Baca know at the time what was coming?